Back in February, Wild Hill Flowers and Events had the honor of coordinating and designing the floral for the Eighteen Ninety Winter Showcase and Styled Shoot! The team of vendors for this event was UNREAL! Eighteen Ninety is gorgeous as it is, but fill it with a talented group of creatives and the space was overflowing with beautiful details. The weather on that February day was chilly and gray, but we were dreaming of spring when we designed this shoot! 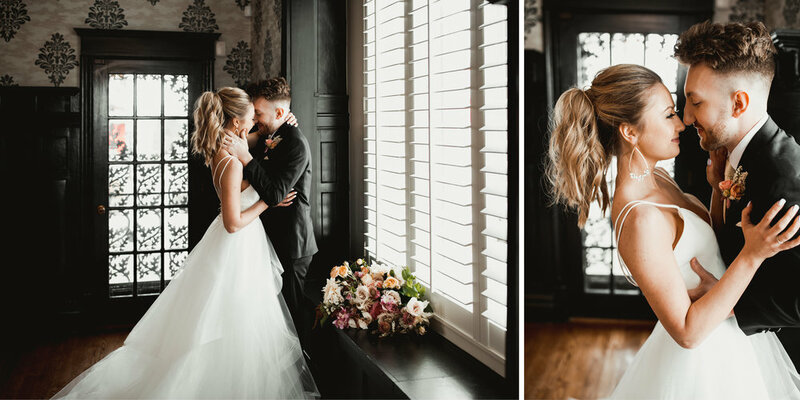 These gorgeous images from Felicia the Photographer are sure to have you inspired for spring! Keep scrolling to see the full vendor team! Gorgeous marbled table linens from Citrus & Sage Co + our Wild Hill acrylic stands and floral piece! Stunning v-neck dress with full layered tulle skirt from Something White Bridal Boutique! This dessert station was one of the highlights of the evening! The gorgeous macaron tower and other desserts were created by Kate Smith Soiree and rentals by Supply Events! BP Creative Group designed this lovely invitation suite for the event! Keep scrolling to see the unique hanging place card display they dreamed up!